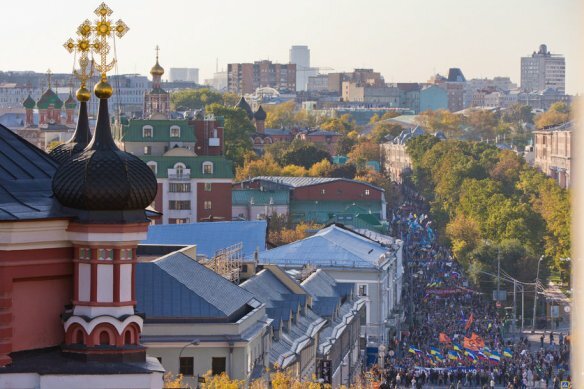 Moscow marches for peace. (Photo Novaya gazeta). Big guns have mostly remained silent in eastern Ukraine last week, but diplomatic battles at the United Nations General Assembly have not shown any recess. Russia used to be able to score some easy points at this seasonal show by denouncing the United States’ unilateralism and hegemonic arrogance. This time around, however, it is Moscow which has been the main target of censure, a tone set by President Barack Obama, who defined Russia as one of the main threats to international security, on par with the Ebola epidemic and Islamist militant groups operating in Iraq and Syria (Kommersant, September 26). Russian Foreign Minister Sergei Lavrov tried every professional trick to deflect this severe criticism, but his reassurances of Russia’s commitment to a “peaceful solution” to the Ukraine crisis ringed false (Nezavisimaya Gazeta, September 27). No amount of political hypocrisy can camouflage the odd configuration established in the eastern Ukrainian war-zone by Russia’s military intervention. Ukraine finds it unacceptable, the motley crowd of Moscow-backed “rebels” seemingly cannot make any sense of it, and Russia itself apparently has no clue about what to do with the “rump Novorossiya” its actions have created. Read the column in Eurasia Daily Monitor, September 29.